Oh… and congrats on the new tv show!! Sliced chilled avocado is a very good addition to BLT and I usually omit the mayo though. You are juggling with your tight schedules now. The lechon is your jumpstart vehicle to stardom and lucky charm! Now you get me craving for a BLT. Thank you for your blog. Wow!! Looks so delish. Have not done that bacon yet as have not found those carraway seeds yet….Congrats on your new tv interview. Please let us know when it will be so we can watch it or block our skeds to be sure we can watch it. oh, i love BLT!!! but i prefer it on a roll.. :) huh? do u now have a tv show??really??! congrats MM! Add an avocado and I am there. Hi MM. Re Time magazine’s lechon feature: my friend and I were dismayed by that photo the magazine used in its print version. First, the picture is minuscule. Second, the choice of black and white — how is the reader supposed to associate the words “best pig ever” with a picture that does not capture the glistening golden crispness of lechon skin? Third, I had to squint to figure out where the lechon was in that photo; the subject of the article was unrecognizable! Of all the possible choices out there, the magazine chose one showing lechon wrapped up ready for delivery, with only a teeny portion of the head peeking through all that packaging. In contrast, the opposite photo of a ski resort in China is huge and in full vibrant color. To say that the lechon photo did not do justice to the write-up is an understatement (the online version is much better). The magazine ought to have gotten in touch with you and secured your permission to feature one of YOUR photos. wow…..i like BLT but am excited for your segment on a local tv show……when is it showing????? I am happy that your efforts on this blog have finally started to generate the right kind of attention to be able to translate to a wider audience. Hopefully, the attention will bear fruit in bringing focus to your feeding programs also! why do i keep envisioning a sunny side up in that BLT….. and a glass of cold beer…. i want! i want! no wonder, i have bacon-like belly, hahaha! wow, mr.mm, you are reaching superstar status. congrats!!! In an effort to limit preservatives, I have been frying up Japanese Organic Pork Belly slices. Great texture. I prefer having control over the salt. I must say though that I do miss the smoky flavor. Its great using home cured bacon for a BLT especially since you can cut nice and thick slices. My favorite commercial bacon though is still Nueske’s Applewood Smoked. For local commercial bacon its Purefoods Lean N Mean. Ever since we first tried your recipe for home-made bacon, we have not ever again bought bacon at the supermarket. It is that good, and that easy to do. Thanks again. how sad..no bacon here in Saudi….miss ko tuloy BLT ni MM. Thanks for the blog! Keep up the good work MM. Hmmm, gotta look-up this bacon recipe next! Yummy, yummy, I have some pancetta, so I’m going to make this for lunch now. Yummy, Yummy … And looking forward to that show! … Pork, yummy, yummy. Congrats on the TV show MM. Will you post the link to the video sometime soon? 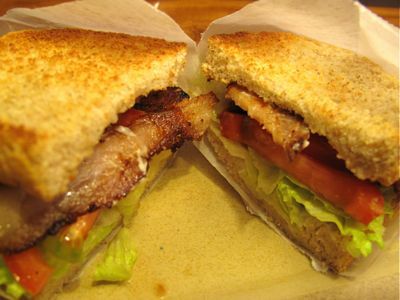 A well-made classic (or non trad) BLT – heaven! I just made my first bacon from scratch. I live in Northern Virginia and I have access to the best (I think) pig farmers on the East coast (US). I bought a 12 lb pork belly from Ecofriendly Foods (www.ecofriendly.com), used a maple based cure and smoked it with apple wood. Yummmm!!! !….However, I would still buy Polyface’s bacon when it becomes available in June. Their bacon is also very good and taste more like Virginia country ham. Another yummmm! I have two unrelated questions you may be able to answer. I am an American who has married a Filipino from Quezon City, Manila. She also speaks Visayan. I try to make her feel more at home by preparing some Filipino dishes. She loves my pinakbet, and I made it for us, the other day. When I cut into the bitter melon, the seeds were surrounded by a blood red membrane. Does this have anything to do with the quality/condition of the melon? Also, do you think kabocha has a season? The only ones I could get that day at Seafood City were already cut in half. They did not look as orange as usual, and were very waxy after cooking. I should mention that I am a professional cook in Napa, CA. I also subscribe to Saveur and have tried that home cured bacon recipe. What I really needed was a good slicer. Keep it up. You inspired me to begin my own blog. You may be able to check it out at the web address above. Salamat po. (in advance) Ingats ka. I had almost daily bacon(beef) breakfast with cheese, bread and butter,marmalade + arabic homous and thinly sliced salami, but no way that you can compare the pork bacon to beef one, taste of beef bacon is good but dry, fat will stick to the mouth once you are at temperature of 12 degrees, it would not be comfortable breakfast, while the pork bacon will roll to your mouth very tenderly, you will enjoy the breeze while eating….I usually got some few pork bacon from US airbase in DOHA,, but this days, access has been tightened and could not be able to get any consumables from them. Should i fly to dubai just for a pork bacon dream????? Scott, I very rarely come across a bitter melon with the condition you describe; I don’t know the scientific explanation for why it happens, but I have used the bitter melon in dishes and they still seem to taste the same. Ideally, however, they should be bright light green. Kabocha, or kalabasa in the Philippines, does not seem to have a season, and is always available, though you may find more of it during the summer months. And yes, it is often sold already cut. Scott…when I was a kid, I remember my mom telling me about this red membrane on the bitter melon. If it does have that red membrane, it just indicates that the ampalaya is on the verge of getting what we call “hinog” like on the verge of maturing. If it was left on the vine, it would have been ideal for seeds! If you are in CA, then you probably have ideal weather than we have here for squashes. Kabocha (winter squash ) takes about more or less 100 days to mature from transplanting date. That is why, I start the seeds indoors and out inthe garden they go by May 24th because we have short summers here. It is a warm weather vegetable….needs heat! So, most likely with this climate change and global warming, it didn’t have sufficient heat so it can grow to full maturity. If you know anyone who grows squashes (maybe MARIA CLARA? )and are the lucky recipient of one of those gigantic hubbard squashes, prep them, cut into cubes and FREEZE! welcome Scott to Filipino cooking and hope you can share to us yr own creation that enhance our food. for the bitter melon with reddish seed nothing wrong with that just that it is almost ripe but if the outside still stay green it is still good for me. MM has good recipe and tips on pinakbet that you may want to search on his archive. if you can’t find that fermented anchovy sauce try the French anchovy just to be a little more creative. by the way the squash or courgette blossom will taste great on that pinakbet. enjoy!!! Sctoo, Thai groceries always carry kabocha squash. Hispanic groceries carry calabasa which is similar but bigger and less dense than kabocha. Harvest is late summer, early fall September-Nov. on the East coast. You should be able to get it CA 6 months of the year. Butternut squash is a readily available substitute. Sorry, typo, I meant to address Scott. I partner breathes bacon. I have to give him the evil eye whenever we pass by the cold cuts/frozen meat section of the grocery, if not, he’ll just load the bacon in and both our cholesterol levels will be up there for the next few days. Anything with bacon is a hit to him…but then again, you can pair anything with bacon and it WILL taste good…I even tried a bacon wrapped strawberry once and it worked.